We’re delighted to announce that 3Space’s new project, International House in Brixton, was awarded an Honourable Mention, alongside Harvard University and IBM in the Spaces, Places & Cities category in Fast Company’s World Changing Ideas Awards 2019. Here’s a little background to the project and its aim to change the way people use, share and access existing urban resources. Cities across the world, New York to Sydney alike, face a common problem: as population and wealth increase commercial rents rise and as a result, the community and activities that were once integral to the city’s success are priced out. These activities are the lifeblood of cities, making them innovative, diverse and attractive to outsiders in the first place. Brixton is one of London’s most diverse and socially dynamic areas, similar to Harlem in New York and the Mission District in San Francisco. In the 1920s it was south London’s shopping capital, in the 1950s it became home to immigrants from the West Indies, then in the 1980s it saw notorious race riots. Today it has become one of London’s most rapidly gentrifying areas, with spiralling property prices and rents putting the existing community under pressure. 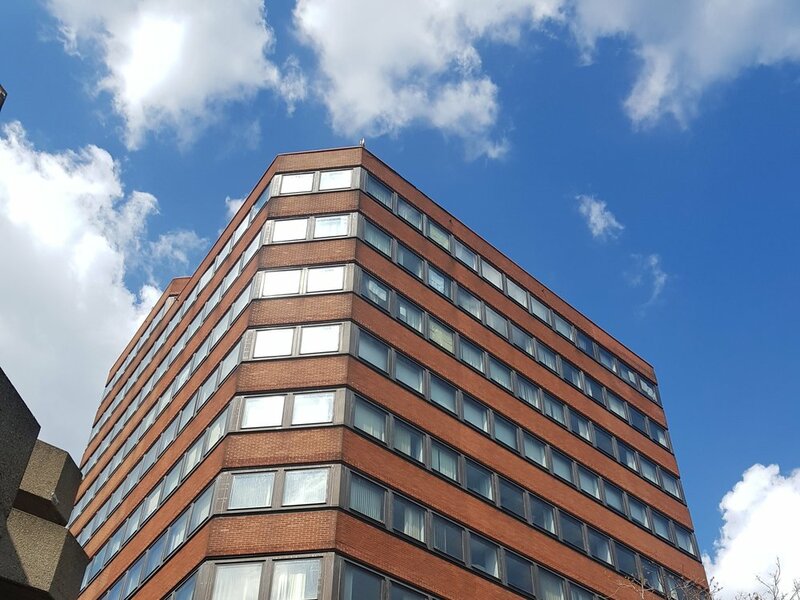 International House is a 12-story, 70,000 square foot, ex-local authority office building that we re-opened in October 2018 as London’s largest affordable workspace. The building’s operating model is built on a unique BuyGiveWork model. BuyGiveWork means one for one - for every desk bought by a business or freelancer 3Space (the non-profit operator) gives one desk away. At International House five floors (25,000 square feet of space) are provided free of charge as part of the initiative. International House is a 5 year project working with Lambeth Council the local authority owner of the previously vacant surplus property. Typically the approach for areas such as Brixton would have been to let or sell this office block to the highest commercial bidder. Instead, the BuyGiveWork model requires little or no upfront funding, using an existing asset to act as a catalyst for positive regeneration. BuyGiveWork ensures that the local community will be much better prepared, engaged and receptive to economic development. With a much lower cost base it also enables flexible experimental uses and organic development, shaping the outcome of the district in real-time. Youth Entrepreneurship - working with established Brixton charity Business Launchpad to provide workshop, meeting and desk space along with advice for young entrepreneurs. The Fabric Floor - working with Assemble, a multi-disciplinary collective working across architecture, design and art, to provide studio and machine space for graduates working in textiles. This will include an educational programme led by the practitioners based on the floor. Community Initiatives - a place to work and meet for over 40 local organisations who are nonprofits or charities working in the local area. Art projects - working with Photofusion, London’s largest independent photography resource centre which has been based in Brixton for 30 years, providing facilities including a gallery, darkroom, digital print studio, film processing and teaching studios. Ground floor events - a free to use 100-person event space providing a direct street-level connection with the community. Communal rooftop - the top two floors will be open to the public providing free to use coworking, a business focused event program, along with an all-day hospitality offering, including four locally-sourced food counters. To keep fit out costs low the design reuses existing furniture where possible. For example, the reception desk has been made from old Council filing cabinets, the event space seating made using old laptop storage boxes, and the old desks have been refurbished by applying a wooden layer on top. This approach means that the space is as environmentally sustainable as possible, but also enables even the Buy workspaces to be made available at below-market prices, ensuring greater inclusivity and diversity. 3Space International House is the first large-scale example of a model that could reshape the urban environment by combining a number of powerful existing and emerging trends in a unique but compelling way. First, its creative approach to generating long-term economic value by unlocking under-used and often dilapidated existing spaces is not dissimilar to the approach taken by the High Line in New York. The High Line is forecast to generate over $1 billion of tax revenue for New York, however has become almost too successful and is contributing to widening inequality. However, using a wider variety of existing commercial buildings means the increase in value can be dispersed more widely than a one-off railway. In London alone, there is an estimated 6.5 million square metres (27 times the size of Westfield London, Europe’s largest shopping mall!) of otherwise empty space which could be used in this way. Companies like Breather and Appear Here that are pioneering flexible access to commercial real estate, however often not all these underutilised spaces can be let commercially. Which is why the Buy One Give One model (pioneered by the shoe company TOMS, whereby for every pair purchased one is given to a child in Africa) is so exciting. As far as we know, we are the first in the world to apply this model to the commercial real estate sector, but the initial feedback has been overwhelmingly positive as the impact of the donated space is immediately and powerfully visible to the commercial party. Finally, and perhaps most excitingly, this model helps solve one of the other huge issues facing many organisations: lack of employee engagement. At 3Space International House all employees of commercial businesses, of which will be over 400 people when the building is full, are required to give one hour a month to the BuyGiveWork initiative. This could include, for example, mentoring a local charity on digital skills, taking a class on fabric cutting and fashion design with local designers, or reviewing a business plan for a young entrepreneur. Early commercial tenants have reported that this was a powerful factor in their move to the space, over any of the other purely commercial workspaces. Millennial workforces are becoming much more aware of their social impact and of increasing inequality. We believe that, just as there is demand for environmental sustainability and buildings that use less energy, there is also growing demand for workspaces which have a positive impact on the surrounding community. 3Space has been trialling the model for the last 2 years in its space Keeton’s & Collett in Bermondsey where a recent report by economics consultancy Hatch Regeneris found that 65% of businesses using 3Space’s facilities interacted with the local area more, and 80% believed successful operation was due to being based there. Purpose-driven brands will have to keep on expanding their understanding of their overall impact. While WeWork’s high-end offering drives up local prices and can be seen to have a negative effect on existing communities, BuyGiveWork enables growth to occur while still keeping the diversity and potential for experimentation that makes cities great.